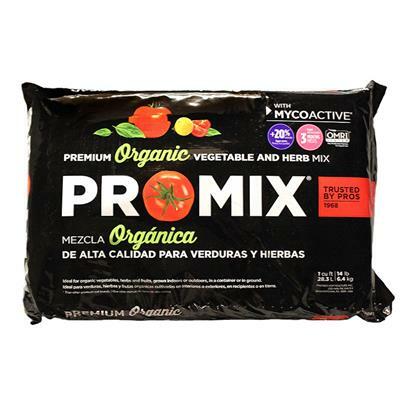 Pro-mix Premium Organic Vegetable And Herb Mix, 1 Cu. 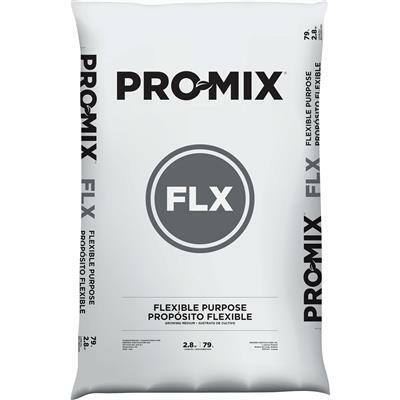 Ft.
Pro-Mix Premium Organic Vegetable and Herb Mix is OMRI-Listed and Ready-to-use. 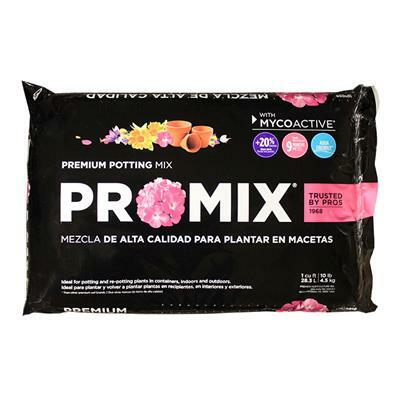 This peat-based mix is perfect for all your vegetable, fruit, and herb garden needs, whether in-ground or in containers. 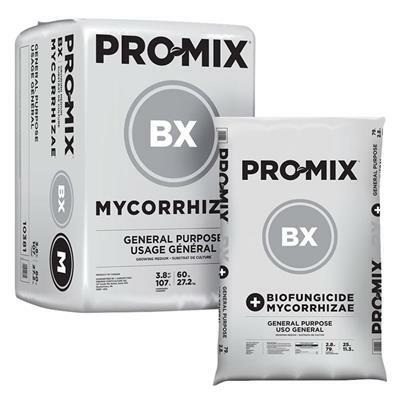 It is specially formulated with an organic fertilizer that provides gradual feeding to your plants, gypsum for amazing tomato growth, and MYCOACTIVE that will help produce vigorous growth and a bountiful and healthy harvest. 1 cu. ft. loose fill bag. This is the first time I tried this soil for my vegetable garden and it's very good quality. No extra pieces of twigs, etc. I mixed it with worm castings and I'm already harvesting some greens! Will definitely buy again! I really do like this product and more importantly so do the plants I have started in it. Thank you for the order. I will be happy to order again. 5/5 A+ Great business. Pro-Mix Premium Organic Vegetable and Herb mix is a great product. It works better than different companies Organic mix for my plants, growing healthy plants and 2x the size. I will be happy to order again. Thank you for the outstanding Organic mix. Great Business, 5/5 A+. thank you greenhouse mega store for the organic soil. This is a great company with trusting customer service. 5/5 A+ Great Business, thank you. Delivery right on time, fast. Planted herbs, scented geraniums and mints in containers. They are growing healthy and fast. Soil is draining perfectly. So glad I found this product at your store. Will be back. 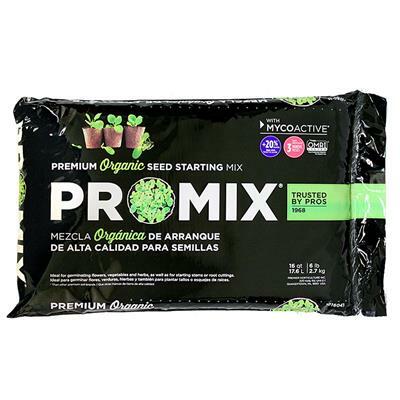 I Love Pro-Mix Potting Mixes!I have Two 4-Foot (By) 12-FootVegetable Raised Beds in My Backyard.I use the OMRI Listed SKU: SO-PM-UOM for Root Crops Such as Carrots and Onions. Along with ONLY using OMRI listed Fertilizers in My Root Crop Bed.I Use the Non-OMRI listed SKU: SO-PM-UCM in Crops such as Tomatoes and Bell Peppers where the Actual Fruit does not make that much contact with the soil; This method works Great for me; and ALL My Plants are Fed Appropriately; and I know my Food is Safe! we keep an organic farm--I use this product to start my saved seeds. It is just wonderful. Celery which can take 23 days to germinate, already up in 7 days. 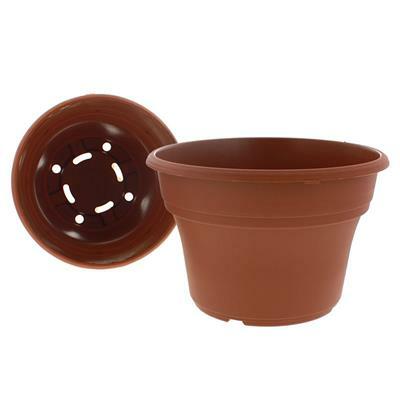 This is a nice quality potting medium. 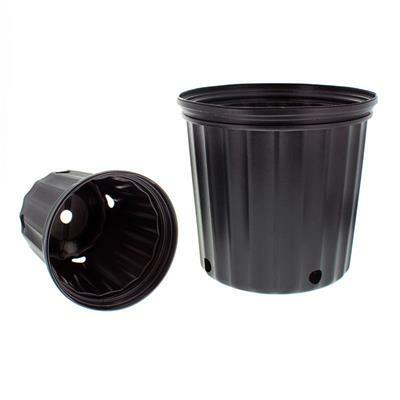 It's perfect for starting seeds or cuttings. I used it for both for a class I taught on plant propagation. Very good mix. My seedlings are doing well. Sterile mix is the only way to start in the house. Best I have used in many years! Used it to start my veggie seeds i am impressed. I will use this product and see what else will help me. This is a great price for a product I won't be able to live without. It is a perfect medium for an organic gardener. Plants love it and so do I.
I love the texture of this and added this to old potting mix by another brand and a good handful of compost. 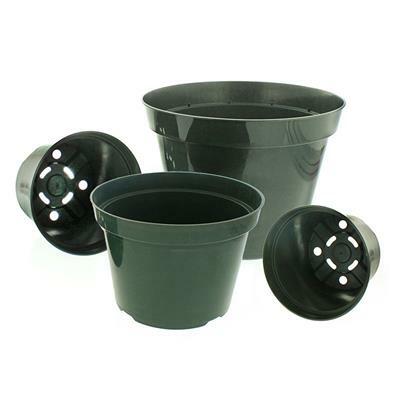 This improved the potting mix and the plants are growing great! I would definitely buy this again. This product is amazing. Switched some vegetables into this mix after using the vigaro stuff from Home Depot. Could not believe the difference. Would highly recommend. Added Azomite & organic fertierlizer to grow micro-greens. Is growing great!! Great service and fast shipping... I cannot rate the products quite yet because I had purchased them for the preparation of next Spring's garden. Wow!!! this soil mix is the bomb! worked very well in seed starting sets. Had germination within 2 days! 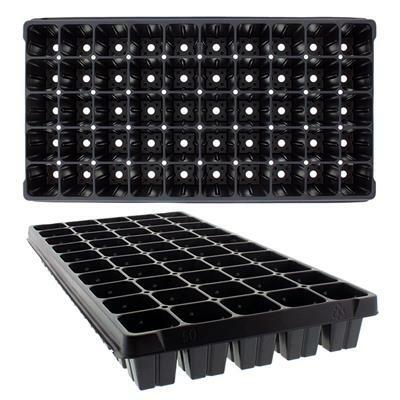 Thank you Greenhouse Megastore for offering this product. I have been on a CONSTANT search for good REAL organic soil. My quest is over, and I have found a product I believe in so much that I have spread the word that it is truly a MIRICLE growing soil , unlike the brand Miracle grow this is a FOOL proof soil that will make ANY plants happy, and in turn u too will be happy. Believe me I would not be taking my time to promote this unless I truly believe it was the BEST! I should do sales for them ;) lol.